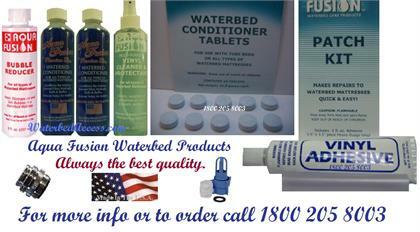 We carry a full line of waterbed conditioner by Aqua Fusion & Blue Magic for softside and hardside waterbed mattresses. Aqua Fusion and Blue Magic water bed conditioner works for all size water bed mattresses including California king, eastern king, queen, waterbed queen, full, twin and super single. We have Blue Magic All Purpose and Sapphire conditioner along with Aqua Fusions Premium conditioner along with vinyl repair kits and vinyl cleaners. If you have a soft side waterbed with tubes we also carry waterbed conditioner tablets which are very easy to use. Our conditioner works with all water mattresses including these popular brands- Classic, Somma, Boyd, Blue Magic, Pro max, Seally, Simmons, American National, Strobel, Strata, American Waterbed, Land & Sky and Kuss. 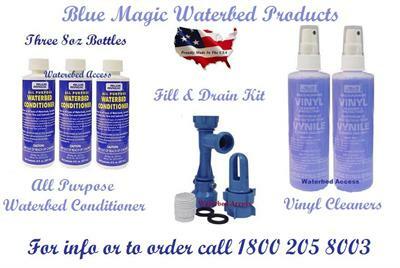 If you have any questions about any of our waterbed conditioner products feel free to email or call. If you need premium waterbed conditioner, fill & drain kits or a mattress repair kit then you should be looking at Aqua Fusion products which is one of the oldest manufactures in the in the waterbed industry. We ship all their products from New York.